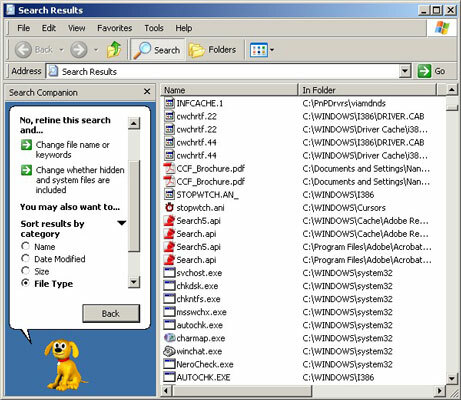 Use the Search function in Windows XP to search for and find a lost file — you can search for a file even if you don’t remember its entire name. Windows XP makes it easy to search for a file, which is a good thing — because nothing is more frustrating than forgetting where you’ve saved a file and not being able to find it. In the Search Results window that opens, click the arrow for the type of item for which you want to search: Pictures, music, or video; Documents; All files and folders; or Computers. You can search by any or all of the criteria listed in the left-hand pane. Select any of the criteria and then enter a word or phrase to search by. If you click the Use Advanced Search Options button, additional options appear, including a keyword feature for words or phrases contained within documents, a field to specify the search location, and a way to specify file size. Click the Sort Results by Category or View Results Differently arrows to get a different perspective on your results. Sort Results by Category allows you to sort results by name, date last modified, size, or file type. View Results Differently lets you select different graphical or text representations of results, such as thumbnails or details. 4Search again, if you need to. If you didn’t find what you were looking for, click any of the arrows under No, Refine This Search to search again. After you locate the file you wanted, double clicking the file opens it for you.